"We would love to do it"
Now Diablo III: Eternal Collection has finally unleashed hell on the Switch, discussions have been raised about other Blizzard titles that could potentially be released on Nintendo's hybrid device. Previously, the company said StarCraft is unlikely, Overwatch is feasible and not to rule out the insanely popular digital card game Hearthstone. Our philosophy has always been we want as many players playing Overwatch as possible, and we want to reach as many possible Overwatch players as are out there. We will always explore a platform if we think we could make it viable - both the technology and the business relationship. We would love to do it. We don't have anything to announce or any plans with Nintendo or Switch at this time, but... it's something we're very open-minded about. In 2017, Kaplan admitted porting the game to Nintendo's platform would be a real challenge. Then in August this year, Blizzard senior producer Pete Stilwell said it was possible. It's also known Nintendo and Blizzard maintained a healthy relationship during the development of Diablo III on Switch, so hopefully, it does lead to more games being ported across. Would you like to see more Blizzard games on Switch? 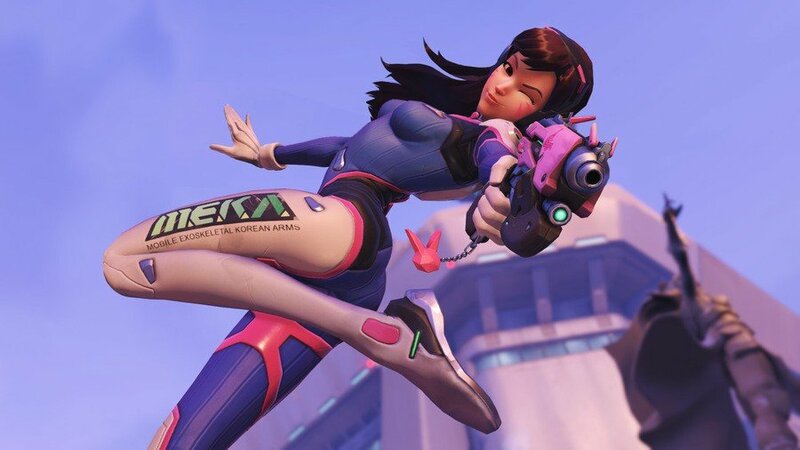 Would you like to see Overwatch ported to Nintendo's latest system? Tell us in the comments. I’d bite. Fortnite won me over and I’m sure Overwatch could do the same. If you do, don't forget the gyro controls. Isn’t the game starting to get a bit old by now? I’d still buy it though. Just tell them it's a cellphone but with analog sticks. This would come the day after I finally give Paladins on Switch a try. It's nothing like paladins, Overwatch is 1000% PERCENT better than paladins. Don't compare paladins to this great game. If this happens... I will definitely get it opening day. P.S. Liam, did you change the cover pic 'cause of me? It'd be a day one purchase. If you want to endorse Overwatch on the Switch, go out and purchase Diablo 3. Buy one for a friend too! I like Paladins, never played Overwatch but if it comes to Switch I'd pick it up. Gyro aiming is preferred as others have already said. It's a dead game and Paladins is better. I am really over this game by now, I have moved on and it was never really my thing. All the kids are on Fortnite so I feel like Overwatch is past it's prime. If they can make it for Switch, then they can easily make it for the phone. I bet 10$ that tomorrow Blizzard is going to make a statement about how they aren't interested in bringing Overwatch to the Switch. Its also back and forth with these people, they never stick to an answer. It’s a shame about StarCraft. I still think it could be done but oh well. Guess if at first u don’t succeed, forget about it. I might be interested in Overwatch. Id get it for sure. also don't forget to bring it to mobile cas we all have phones don't we ? Eh, I could only see myself purchasing it again if they added some kind of singleplayer component. I enjoyed it enough on PC with my girl, but I don't want to have my Switch tied down by any online-only games. Release Diablo 2 or Starcraft 1 on Switch and harvest minerals. After they dropped the rare gacha rates from 10% to 3% I haven't touched the game, and a Switch release wouldn't change that. Um... These developers keep forgetting that the switch has power greater than the PS3 and XBOX 360. Weren't they developing games for those systems for over seven years? Where did that experience go? Why do developers even have to question whether a specific game would run on the switch? It is obvious the switch can handle any game, provided that the developer knows how to code efficiently. I can guarantee that Red Dead Redemption 2 is capable of running on the switch. Rockstar is just too full of pride , and is incapable of compressing textures and scaling down models. None of what I saw while watching my brother play is infeasible on the switch. The snow mechanic reminds me of the sand in Skyward Sword, where you would use wind to produce creases in the sand. This ran fine on the Wii, so I doubt the Switch can't run it. Another feature I saw that will have no problem running on the switch are the cutscenes, previous games have used prerendered cutscenes so why not use a similar technique when porting to switch? Also the filters when Arthur is injured, a very simple post-processing effect that I doubt takes a lot of power. The "god-ray" effect, I have seen it on many games on the switch, so I doubt that can't run as well. So in a nutshell, Rockstar and other developers simply refuse to try, because of numbers on a spec sheet, yet never really try to find alternative coding techniques. Also, they never optimize the code for the machine they are building the game for, because they assume that a powerful device will run anything. The truth is, that even the best PC rig out there will struggle to run really bad code. I bet Panic Button could port RDR2 to the switch, and naysayers would finally shut up. That is my rant for today, I'll be here all weeks folks. Wow, you're still reading? @Dazzle stats to support assertion pls. @penamiguel92 I see where you’re coming from, but the only reason games like Doom and Wolfenstein work is that they were made on a scalable engine which was created with the Switch in mind. Games like RDR2 wouldn’t work on the Switch unless they took it to pieces and remade it. It would have to be a virtually brand new game. If I could bring over my nearly completed hero gallery then sure. Unlikely as cross-saving with Overwatch has never been done before. It can run on potato’s and it’s already ported to consoles. The only reason they haven’t released it yet is business facing and other corpo speak of how to best milk your customers and maximazie your price point. It is worth noting that yesterday Blizzard announced that the next major update for Overwatch would require a full re-installation of the game, bringing "fundamental changes to the game client". People are suspecting (and hoping) that this is will improve problems with performance and fix a number of bugs that have been around for a while. Hopefully, their planned changes will increase stability to the point where a Switch version is feasible for them. Overwatch really had me for a full year, lost interest but still played on and off for the next year but now I'm completely over it. They went so overboard with balance and constantly reworking characters that it's just not fun anymore. It would be cool if they bring KB/M support to consoles. But Microsoft has to hurry and announce KB/M support for games first for that to happen. Which should happen tomorrow. I don't mind playing with a controller, but nobody takes Overwatch on console seriously because of the lack of KB/M support. @NintendoKnight don’t get too confident there dude. The games have pretty drastically different approaches to the hero shooter genre. I’ve got a lot of friends who’ve moved from one to the other for a multitude of reasons. Saying Overwatch is 1000% better is like saying BOTW is 1000% better than Skyrim. Both are undoubtedly open world action adventure games with RPG elements, but it’d certainly be unfair to say one is straight up better than the other. @Riderkicker it’s still worth trying Paladins out, especially since it won’t cost you anything given you’ve got download space available. It’s not as triple-A visually as Overwatch, but the game depth and mechanic design is incredibly high class, and it leaves a lot of room for player expression and experimentation with its card system. Both games are very good, and both are worth giving a shot! If the frame rate was solid I would totally check it out. I play a decent amount on the PS4 and frankly, I don't think I'd miss a lot of the little graphical touches if I were playing on Switch. I'd want them to finally add cross-save though. Loot crates seem like an even worse investment when you have a separate skin collection for PC, PS4 and Switch. If they're connected to the same account I don't see why they can't just carry over. It can run pretty well on my laptop so I think it would be very possible to port to the Switch (not that I know anything about the technical side of these things). I wouldn't double dip but it's a very fun game and it would be great for Nintendo to have another massively popular game on the Switch. @Monokuma Blizzard is talking with Microsoft and Sony about that. Yeah great, but I already play it on PC too much. Don't see why I need it on Switch then. Hopefully Blizzard adds crosplay though. Wrecking Ball = Bowser Jr.
@NintendoKnight I used to play Overwatch on PC. Part of why I tried Paladins was to find a replacement for it as I was no longer enjoying it. There are things I'm already liking about it over Overwatch such as the ability to switch to 3rd person view & mounts to quickly get back into the fight from respawn. @fugl Yeah, I've only played a handful of games & already seeing what you mean. Being a healer in Paladins is interesting to say the least. With Seris I can get long killstreaks while keeping teammates alive. @Riderkicker Seris is one of my favourite healers and yeah, there’s a pretty strong emphasis on mobility options with most champions so you can do well on the eliminations screen even with supports. Supports like Pip are often even able to fulfil straight up flank or DPS roles in ranked with the right set ups. Highly recommend checking out card builds online for champions that catch your eye. Every champion can be played in numerous ways. @gloom It's a competitive online game with a decent eSports following. It will be going for years to come. Not to mention that Blizzard has a good thing going with these characters and the side stories behind them. They can keep that interest going for a long time. Either way, Blizzard is a solid studio and getting Blizzard to make more games for Switch is a good thing™. Feels like Hearthstone should be on Switch already. Seriously. My guess, though, is that Blizzard was waiting for all the online policies to be sorted out. Plus, the way that game makes money could be considered gambling (the card packs), so there is that. @fugl May have to do that with Seris to see what I can really do with her. Also Fernando as he'll probably be my first unlock. He's almost like a more aggressive Reinhardt. @PlayedNSlayed My guess is that the game has already been in experimental development for the Switch, and porting is much faster than building a new game (and they have real experience with Diablo now). Also, Overwatch won't be getting a sequel any time soon. It's the type of game that evolves and builds over time with additional characters slowly changing the balance. @Riderkicker if the idea of a speedy cheeky poking seris who can still torrent in healing sounds appealing, look up Vex30 on YouTube (possibly the best support main in NA’s competitive scene, also happens to make very informative content) or try and find an Umbral Gait Seris build online. And hell yeah dude, Fernando happens to be my main tank. He’s often played as a flank too due to his speed and damage output. Hope you enjoy your time with the game! I would be cool to have a guest Nintendo character like Samus Aran in Overwatch, but then I guess you’d have to sacrifice cross-play which is more important really. Once you go 144Hz mouse+keyboard, 60Hz with JoyCon is a no go in the mentioned title. Wouldn’t buy it. The landscape for the Switch has changed — or the perception of it has, at least. Like many developers, Blizzard had justified skepticism towards the platform. Sure, it would have been great if they'd jumped in early, but that has never been Blizzard's approach to non-PC platforms in the past. (Look at the backlash when they dared make a game for mobile first). Additionally, while companies would prefer that everyone at a company speak with the same voice on issues, a company is made up of individuals and sometimes you get a different answer because you ask a different person. I respect when people change their minds, and when it is for the right reasons, it is commendable. "Sticking to your guns" when it is stupid, is not a virtue. @Ogbert That is a great idea and the perfect character choice, actually. Easy solution is to make it a new character for everyone — easy, if Nintendo agrees. lol. Diablo Immortal coming to Switch and not to PC or other consoles. I would love to play Overwatch on my Switch. Id buy it. I like Paladins and its a great option but its just not as good. I couldn't stand the boredom of Fortnite for more than a few rounds, but I do like matches in Paladins here and there and from what I've seen/heard Overwatch is far better, so I'd likely get it and hopefully it would have gyro controls - something Paladins is sorely lacking. If there's one thing that Blizzard loves to talk about it's how open-minded they are. "Why should we make more Switch games? You guys have phones, right?" @DenDen It may down from its peak active player base a year or so ago, but there's still millions of people playing regularly. Queue times are still low (outside of the highest rank), and it'll still take years at a minimum for that to change. Lots of people play when there's hype, then eventually numbers fall away to just those who really enjoy playing long-term. Doesn't mean a game is dying. It'd be better than an Overwatch smartphone game... right Blizzard?! @BenAV "If you do, don't forget the gyro controls." The Switch has built similar controls already did one forget BoTW when in handheld mode. … and very close minded about Diablo Immortal on the PC or console 🙁. Of course they would be open minded to it, you know, when their stocks are in free fall. Overwatch and/or Hearthstone on Switch would be AWESOME! To late the overwatch day is done! Forget Fortnight! Overwatch is much better! @NintendoKnight ummm they are essentially the same thing and I actually prefer the more casual experience of paladins. The overwhelming amount of sweaty tryhards in overwatch is nauseating. Overwatch is now one of my top 5 games of all time (so I'm biased) but I think it would be great for Switch. The graphics can be scaled to suit, just make sure it's at 60FPS. I do think gyro controls need to make it in. Some characters (Widowmaker, McCree, etc.) just don't do as well on console, buy gyro would fix that. I would totally abandon my PS4 progress to play on Switch. Would be all over this. I want StarCraft on Switch! Am I the only one who would like WoW on the Switch? And Diablo II Remastered as well. "hopefully it does lead to more games being ported across"
Hope; This is what us Nintendo owners have been living off for years now. But it never leads to anything. @gloom Team Fortress 2 was released in 2007 and was relevant for a very long time, I can see Overwatch being the spiritual successor and remaining popular. Trust me, the Overwatch community is made up of some dedicated users. I wonder what they would charge for a Switch version. Know literally nothing about Overwatch. I’ve always been a Blizzard fan since the original Warcraft game, but my experience is limited to just the “Holy Trinity” of Diablo, Warcraft, Starcraft. Since a couple of years ago I play Hearthstone a couple of times each day, but any of their other games (including World of Warcraft) are literally unknown to me. Eh, I'd lean towards this just being lip service rather than anything serious. I'm sure Overwatch is possible with a bit of downscaling, but I also recall Activision-Blizzard not being particularly happy with profits generated by PS4 and XBoxOne sales. While Switch is gaining momentum, I don't know if they see putting their title on a system with such a comparatively small user base as worthwhile. To clarify, I'm not usually too hard on companies that do this, but between Overwatch's lootboxes (they could at least provide an in-game shop for buying things... you know, without the government cracking down on them) and the recent Diablo controversy, they're looking more like Activision than Blizzard these days, and the former does not think much of long term planning, since it means waiting for money to come. Already have Paladins. Why does need Overwatch? Blizzard Games Needed. But Blizzard, you do realize Switch is not a...you know... phone? Great for those interested but I can’t stand the Blizzard model of game development. Make one game every couple of years and milk the cow till it dries up. To call games like Overwatch games at all is a bit misleading in itself. It’s more like a service which Blizzard provides a means for players to grind their wheels and take part in monetary practices that encourage gambling. @NotTelevision You can claim that calling any game you don't like a game is misleading. When you boil most games down to their nuts and bolts, it doesn't seem like anything special, but I have legitimate fun playing Overwatch and I think they've been handling the ongoing nature of the game very well. Overwatch is one of my favorite games of all time, but I don't see the point in a Switch version. It'd be inferior to the PC version and the portability of it wouldn't matter. @NintendoKnight Paladins is free, can't really expect it to match the standards of a game like Overwatch. Personally i think paladins is the better game but to each their own. Why would they need to ? It wouldnt be Overwatch. That's great and all for people who enjoy it but unless they implement Splatoon levels of motion control, I'm not interested. I'd much rather have Hearthstone on the Switch. I love Paladins, so I’m sure I’d dig this too. Blizzard is probably too busy partnering with Netease and other Asian publishers to bring their IPs to mobile rather than porting their already existing games to the Switch. Expect more Diablo Immortals, not Overwatch Switch. Do it!!! I'm sure it'll sell! @Frendo I’d say whining about ports is justified. People bought a new system to play new games. @Peterjr1 I have bad news for you. My friend who used to play OW on PS4 but moved to PC to join us had to grind for items all over again. I suspect a Switch version of Overwatch would also have the same limitations.